I've been off the bike for more than a week, following a fall on an icy road at a corner on a minor roundabout in North Brent. I turned left to exit the roundabout, but the Brompton continued in the same direction it had been travelling in, we parted company, and I ended up on my bottom, on the road, yelling. This is only a very minor road junction with little traffic, and had the 1930s builders of the road not decided to plonk a roundabout there, I would not have had to make a left, but would have been able to cycle straight on, and maybe would not have come off. Anyway, there were no cars on the road, but a number of people came to look and offer help as I made such a noise, and the first thing I asked them to do was to take the bike out of the road. They offered to get an ambulance, but I found I could get up, so it did not seem to be necessary. A kind lady, who was a health worker, offered to take me home, as she was driving in that direction anyway, so I accepted, and the Brompton could come in the car too, being a folding bike. My partner Helen, an A & E doctor, no less, diagnosed no broken bones, and no need for any treatment apart from painkillers and rest. I am now almost better. There are a number of lessons arising from this. One is that Bromptons are poor snow bikes. The small area of tyre contact with the road, and possibly other aspects of the geometry, mean they are hard to control in slippery conditions, and it seems to be hard to come off one in a controlled fashion if the tyres start to slip. Others I have corresponded with since have noticed the same problems. My problem was no doubt exacerbated by me having pumped the tyres up to 100 PSI before going out. In icy conditions you should reduce your tyre pressures, perhaps to 60% of normal. Another lesson is not to trust weather forecasts. I certainly considered the issue of ice before I went out, and consulted the forecast, which showed ground temperatures in London remaining above freezing all night. This proved to be totally wrong, as by early evening there was already ice forming everywhere from the snow that had fallen during the day. I do in fact have a hybrid bike with fattish tyres, and I should have taken that instead, and left it at the nearest station to do the rest of the journey by tube. More seriously, the whole thing points up some issues with the UK road environment, and its maintenance, as usual. Cyclists are often advised to choose back-street routes, particularly if they are "nervous" about dealing with traffic. Though I think I am not in that category, and I have, in the past, argued with some force that cyclists do not belong on the back streets any more than cars do, I have devised many quieter back-street routes in my part of outer London, which I often use (they are generally similar to the yellow routes shown on the TfL cycle guides). Unfortunately the strategy, for cyclists, of using minor roads, for comfort or self-protection, is not a good one when the snow falls, as the minor roads, if they are ever gritted, will be gritted after the man roads – seemingly irrespective of whether they are recommended or marked cycle routes. I fell off on the first night of frozen snow across Brent. The main roads were gritted that night or the next day, the minor roads over subsequent days. It was too late. And many of these "minor" roads, like the one I live on, Stag Lane, carry major traffic. The late-or-never gritting of minor and semi-miror roads is clearly discriminatory to cyclists, who often use these routes in preference to the busier ones. The road environment of outer London is hazardous enough for cycling in normal conditions, but when snow and ice builds up, and is swept into the part of the road near the kerb that cyclists use, this makes it far more so. Cyclists must consider their course on the road very carefully, and make very rapid and risky decisions about whether it is safer to be nearer the kerb, or in the middle of the road, "in the way" of the motor traffic, where a fall could be all the more lethal due to the risk of being immediately run over. For the first couple of days of really bad weather, the general driving standard seems to improve, as motorists behave cautiously in unfamiliar conditions, and probably give cyclists more respect and leeway. But as the situation persists, soon things go back to normal, and they are taking as little care of us and each other as usual. 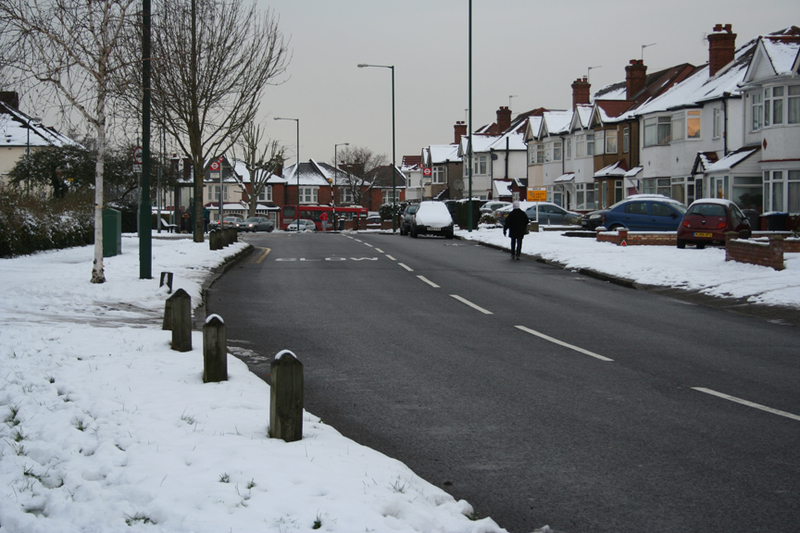 A week after my accident, all the significant roads in Brent had been gritted, and the passage of cars had removed the ice, though temperatures remained below zero. Here is Stag Lane on Monday. This picture points up another bit of iniquity. By this stage, it would probably be safer to cycle than to walk. The road is totally clear, but the pavements are a treacherous sheet of foot-compacted re-frozen snow. No attempt has been made to treat them at all. So far as I know, no pavements in Brent are gritted. So the man that you see in the picture has to walk on the road. Where he encounters a parked car, he will have to decide whether it is safer to walk round it on the road, or on the glassy pavement. This policy of not gritting or salting the pavements means that the old, disabled and frail are trapped in their homes. There is no way that they could contemplate walking roads like these. I think twice about it. But somehow, in this car-dominated society, nobody seems to think this is a scandal (apart possibly from Living Streets, who have a low-key campaign on the subject). And then we wonder what is stopping us as a nation from being "active". In the Netherlands, as Bicycledutch helpfully tells us, and demonstrates with his videos, in general all the paths and roads cyclists need to use are kept completely clear of ice and snow: in a colder climate than we have in England. The same does not appear to be the case for the pavements, and it is curious, to our eyes, to see, in his video, pedestrians walking in the snow rather than on the cleared cycle track. It would be interesting to know what the Dutch policy is on this. The Dutch are now advancing the idea of heated bike paths, but those in the video of s'Hertogenbosch are cleared by a machine that sprays a salt solution. Another point to note is that the Dutch utility bike is typically better-adapted to snow and ice than the British road bike, with fatter tyres, and very stable geometry. I have seen it reported that cycling drops off by about 30% in the Dutch winter, compared with summer. I've not seen any figure for how much lower cycling rates are in winter than summer for the UK (it may not have been reliably measured), but my guess is that the seasonal difference here is much larger. This is not the result of a more severe climate; our climate is milder. It is a result of the generally far lower level of care in this country for cyclists' safety. For the Dutch cyclist on his or her traffic-free paths and tracks, snow is a minor inconvenience, maybe even a bit of fun. For the British cyclist, it is another compounding, complex hazard in the environment of aggressively, uncomprehendingly-driven motor traffic, where the slightest slip could well prove fatal. More snow and ice is forecast for England over the next week. Take care out there if you do brave the roads. You might like to look at this fuller set of tips for winter cycling from road.cc. 100PSI on the front tyre? Whoa! I did try that once on my Brompton but nearly came off at the first bend (on a dry road). You're right about the small contact patch but I think it's also to do with most of the weight being on the back. I now use 55/85PSI front/back. Think of a Brompton as a unicycle with a front stabiliser wheel! I understand where you're coming from but you may be interested to know that (a) the Brompton is specifically designed to carry load on the front (the rear rack being more of a concession to consumer demand), and (b) its tyres are specifically designed to take high pressures as optimal, with 100PSI being the recommended pressure - I believe both front and rear though I'm willing to be corrected on that point. note from NL: most pedestrian areas are not gritted. The old and feeble are home bound thus. Cities do better than country homes in this respect. And does NL have less country homes than GB? I would guess so. Bikepaths are treated the same as roads (at least in most counties): schoolroutes are done first. A kudo to the fietsersbond to bring this about (policy shift from a few years ago). The only complaint I have is that my feet freeze after 45 minutes. But I don't think the government can help that. Limited data from the traffic-free NCN2 coastal route, which has had automatic bicycle counting for the last six years, says that cycle commuting drops from around 600 counts per weekday in (term-time) summer to 400 on winter weekdays. So in summer 2012 we had about 300 people commuting by bicycle along NCN2, compared to 200 in winter: a drop of 33% or so. Which makes sense, as this a traffic-free route used by all sorts of people, not much different to the situation in the Netherlands. These are people using bicycles for transport simply because of convenience, and who will switch to other modes in winter without much thought. I'd expect a smaller percentage drop on the parallel road route, where you're much more likely to find "cyclists" with all the kit needed for winter riding, and the enthusiasm to keep going whatever. Of course far fewer people ride their bikes along the road, which is packed with motor vehicles at commuting times. While the drop during these periods is probably high, I don't think it's anywhere near as high for the rest of winter. I haven't cycled this week, but as soon as it thaws a bit I'll be back cycling to work. 1. Why not give the responsibility of clearing the pavement to the building owners? It would enhance social responsibility and civic pride. 2. Christmas 2010, I spent four days riding a Brompton in Berlin: it was snowing everyday and the side streets were NOT treated at all; some had 20-30 cm of snow. However it felt safe on the Brompton, because of the low frame. Came off only once: hidden diagonal tram track, would have defeated any bike. @point 1 - I think that building owners are afraid of being sued, following all sorts of scare stories a few years ago about how if you clear a length of pavement you are accepting responsibility for it, and if someone slips and hurts themselves on that section then _you_ are liable. another note from NL, about walking on the bike path: I don't know if there is any official regulation, but walking on the cycle paths is treated similar to walking on the road. It's perfectly OK when you have a good reason (sidewalk obstructed is one of them, snow might be another), as long as you behave like a good guest: stay on the side, don't hinder traffic, be ready to step aside if needed. Where possible, try to walk facing upcoming traffic. On a narrow but very busy path during peak hour, don't even try, just like you wouldn't walk on the highway. On a quiet spot, feel free to use it, but keep an ear out for bike bells behind you. I think if you questioned a council on this they would argue that roads have to be done first to allow emergency vehicles to get around. Else to do both its just a case of raising council taxes to pay for it. However, its really just another cost to be associated with getting people walking/cycling, and the financial benefits of active travel have been discussed elsewhere, so I'd argue it pays for itself really. Where I live, the most snow and ice you can still see is lying hard and frozen on the shared use cycle path which goes alongside the main road home. In the city centre the snow and ice have been gone for a couple of days, but not there, which means I'm forced to ride on the busy road instead of the off-rod path where I prefer to be (on that section of road, anyway). Interesting article. What I've found in Cambridge is the opposite (! ); that the last week of snow and ice has actually led if not to more cycling, then at least to a notably higher modal share of cycling out of the total journeys made. 1) Fewer cars on the road when there's snow so roads *feel* safer and inviting for cyclists. 2) Bikes easier and quicker to dust off after it has snowed than a car. 3) Snow on the roads makes driving more dangerous so people choose to bike instead. 4) Cold weather means people prefer to cycle than walk. Someone gritted one major Sustrans route in my area (NCN24, Castle Lane, Hampshire) - very nice. But this was the exception to the rule: we have some very busy school commute shared-paths in the same area and these were left icy. I honestly think that it would not take much in the way of complaining / lobbying to persuade this council to treat major cycle paths. Interesting that failure to grit pavements turns all roads into shared space. Perhaps one reason for more considerate driving during the snow. If only drivers behaved like this year round.